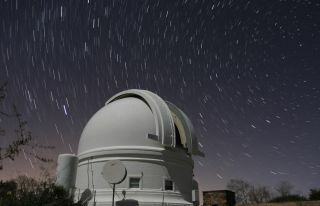 Astronomers using the 48-inch Samuel Oschin Telescope at Palomar Observatory discovered a new kind of supernova in 2011. The Palomar Observatory is an astronomical research center located in north San Diego County, California. It holds a professional set of telescopes used by the California Institute of Technology, but the observatory is also open to the public almost every day of the year. In recent years, Palomar is perhaps best remembered for the discoveries of small worlds near the edge of the solar system. Quaoar, Sedna and Eris were among the objects found using the observatory. These objects were not only interesting in their own right, but also opened up a debate about the nature of Pluto. The vision for the Palomar Observatory is credited to George Ellery Hale, a 19th- and 20th-century astronomer who is known not only for his scientific discoveries — he found out that magnetic fields and sunspots are linked, for example — but also for his business sense. Hale created four observatories, including Palomar. According to Encyclopedia Britannica, he founded The Astrophysical Journal, which to this day is one of the premier publications worldwide for astronomers to showcase their work. He supervised the construction of two large telescopes at the Mount Wilson Observatory near Los Angeles. One was a 60-inch telescope, which was then the largest telescope in the world, and was used by Harlow Shapley to chart the size of the Milky Way, as well as our solar system's position in it. The other was a 100-inch (2.54 meters) telescope that was completed in 1917. By 1928, Palomar had a $6 million grant ($83.5 million in 2014 dollars) in place to construct a 200-inch (5 m) telescope. Getting that ready for work would take about two decades, in a time that was marred by the Great Depression and World War II. It was here that the idea for moving to Palomar took shape, as Mount Wilson was located in what was now a heavily light-polluted area near Los Angeles. The telescope was put on Palomar Mountain, which is 100 miles (161 km) southeast of Pasadena. The first telescope put up there was a modest 18-inch (45 cm) telescope that is now retired. First light on the 200-inch telescope came in 1949. Meanwhile, the 48-inch (1.2 m) Samuel Oschin Schmidt Telescope was completed in 1948, and almost immediately, work began on the Palomar Observatory Sky Survey — the catalog used as a basis for the Hubble Space Telescope. The observatory also houses a 60-inch (1.5 m) telescope that found the first brown dwarf star, among other telescopes. The Samuel Oschin Telescope was the instrument of choice for Caltech astronomer Mike Brown and his colleagues, who found several objects far in the solar system using it. In quick succession, they discovered Quaoar in 2002, Sedna in 2003 and Eris in 2005, among others. The telescope has made many other discoveries over the years, including the first time the entire Northern sky was photographed, regularly discovering supernovae (star explosions) and asteroids, and looking at mysterious gamma-ray bursts that could originate from black holes. Among the more notable discoveries of the 200-inch Hale reflector were observing and helping astronomer Maarten Schmidt figure out the nature of quasars. He examined these bright sources of radio waves, based on information from astronomer Allan Sandage, because astronomers were not sure what the spectra of these objects were telling them, according to the National Parks Service. It turned out that the spectra looked unfamiliar because they were extremely red-shifted — their light was shifted to the red end of the spectrum, meaning that they were very far away from Earth. "Since the objects were too distant to be stars, or even galaxies, Schmidt concluded, they must be something else not previously seen in the history of astronomy," NPS stated. "They were called 'quasi-stellar objects'; that is, objects with a star like appearance or 'quasars' for short." Today, astronomers believe that quasars are actually galaxies with overpowering supermassive black holes in their centers. They remain of immense astronomical interest because they are the brightest objects in the universe. The 200-inch Hale Telescope at Palomar Observatory is used nightly for a wide range of astronomical studies. While once the 200-inch telescope was in an area that was fairly shielded from the effects of light pollution, decades later the sprawling southern California population growth — and accompanying lights — makes it difficult for some astronomical observations. "If such light pollution continues to increase, it will seriously reduce the effectiveness of the Palomar Observatory for many types of research," Palomar states on its website. "Caltech and the Palomar Observatory have worked with and will continue to work with city, county, and tribal governments to diminish the effects of local light pollution." In 2011, astronomers using the Samuel Oschin Telescope and others discovered a new kind of supernova. After finding four supernovas of their own and comparing it to two others previously reported by other teams, the group realized that all six stellar explosions belonged to the same class. What distinguished them is they were pushed very far into the blue end of the spectrum, and that they appear the brightest in ultraviolet wavelengths. In 2010, a small portion of Hale's mirror made a surprise feat: it managed to image three exoplanets. Getting pictures of planets that are beyond our own star is considered quite difficult, as these are small points of light orbiting a very bright star that can wash out their own light. "They combined two techniques — adaptive optics and a coronagraph — to minimize the glare from the star and reveal the dim glow of the much fainter planets," read a press release at the time. The year before, Hale also found a red dwarf star in the Big Dipper that circles the well-known naked-eye sky star Alcor. Just like with stars and planets, finding faint companions to bright stars is difficult because the companions are small and the bright star washes their light out.